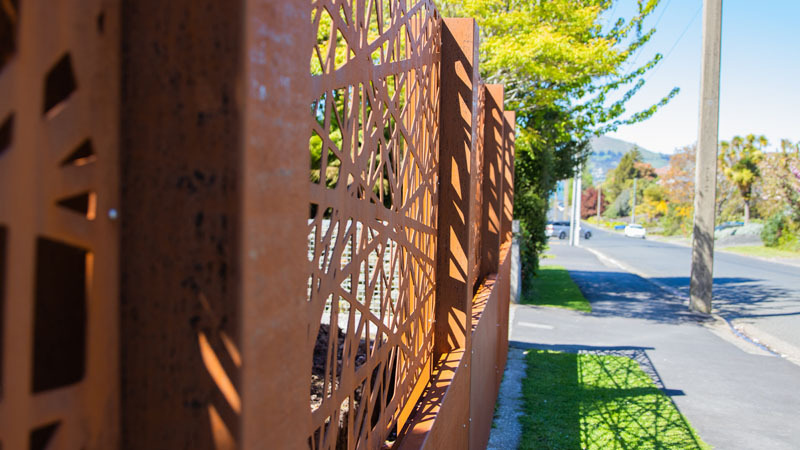 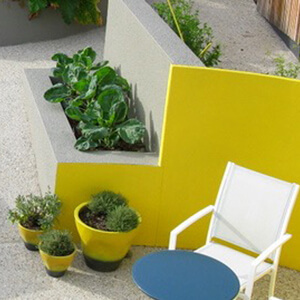 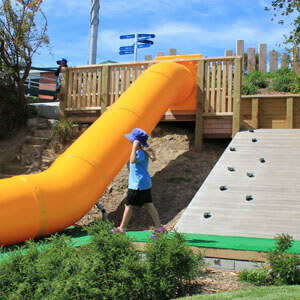 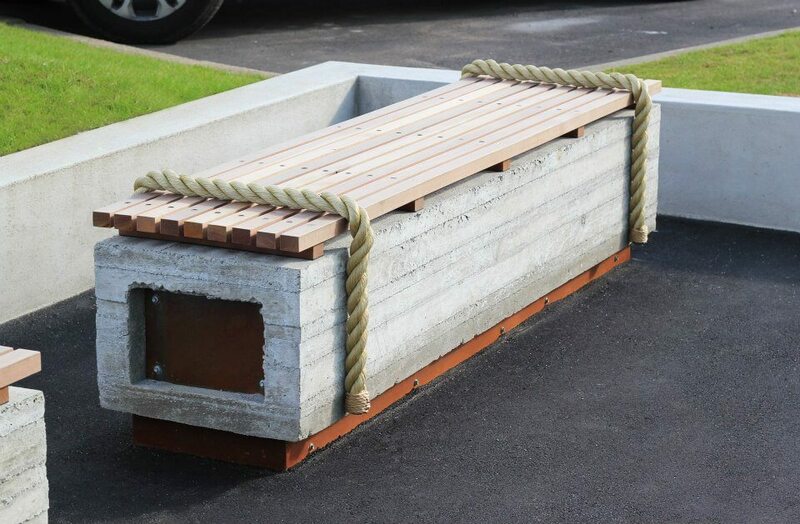 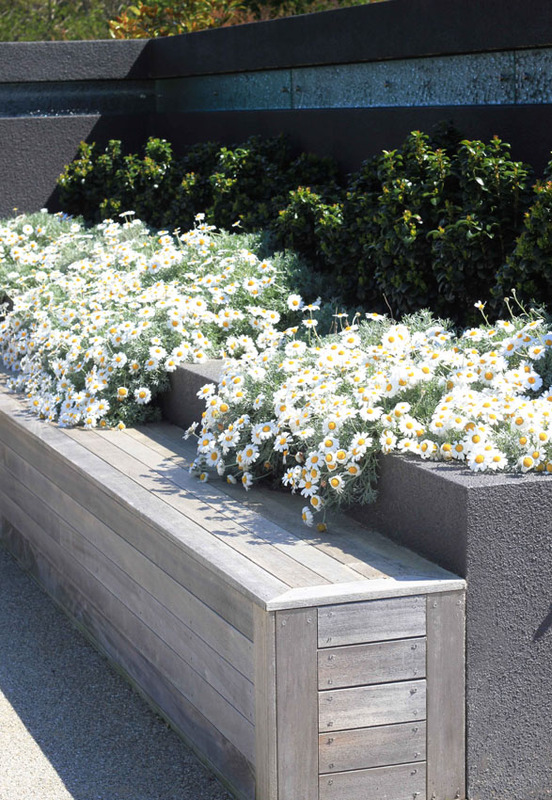 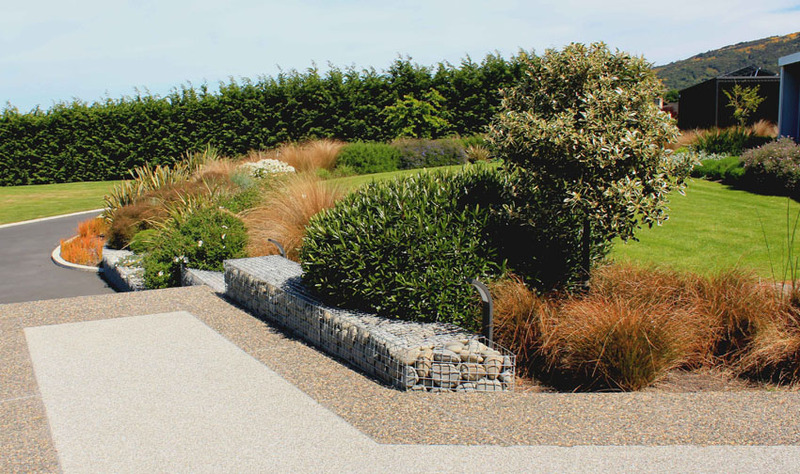 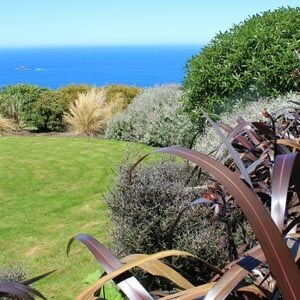 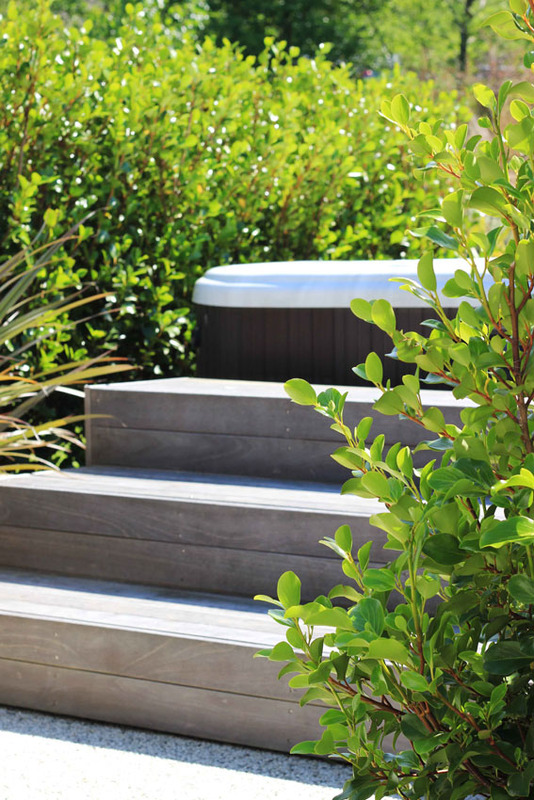 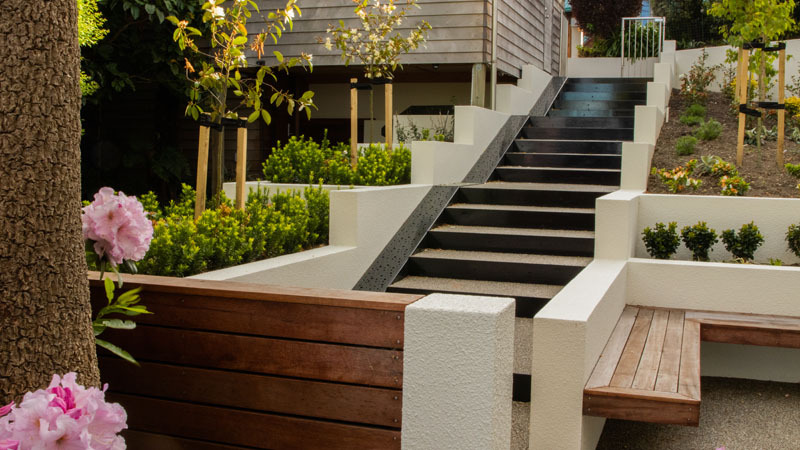 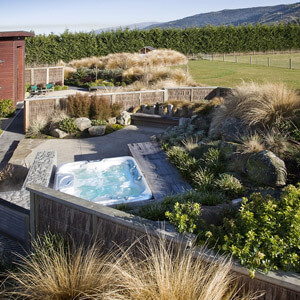 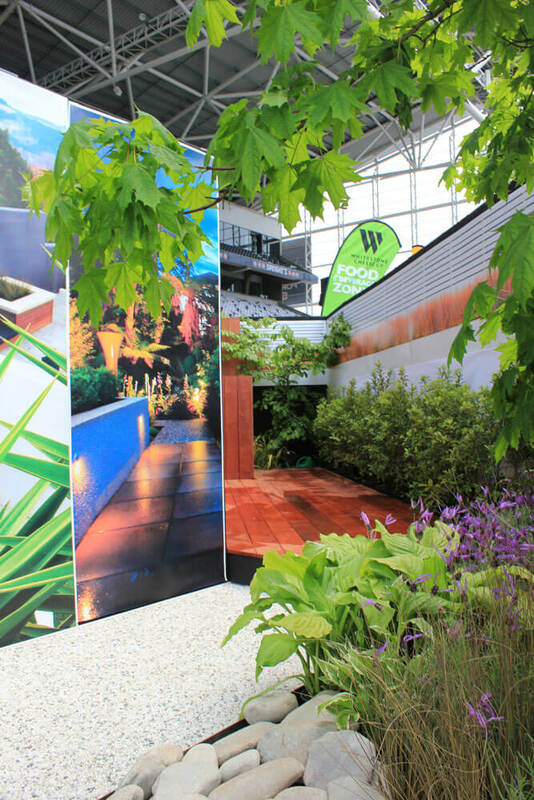 This Mosgiel garden was entered in the 2018 MASTER LANDSCAPES AWARDS and was awarded a Gold Award for horticulture and two Silver Awards for design and construction. 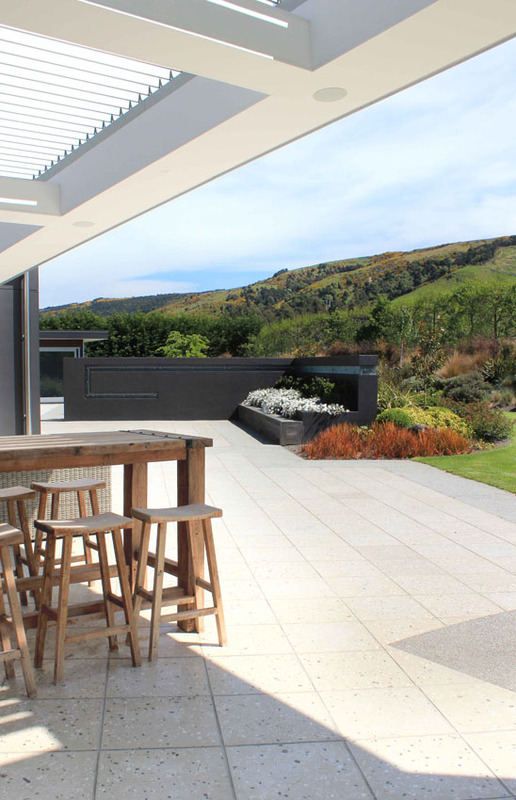 The main design elements focused on a large outdoor entertainment space for all weather outdoor entertaining combining a large overhead VERGOLA and outdoor gas fire, with hard surfaces and paths that allow for easy access, with also a secluded space for a spa out from the master bedroom. 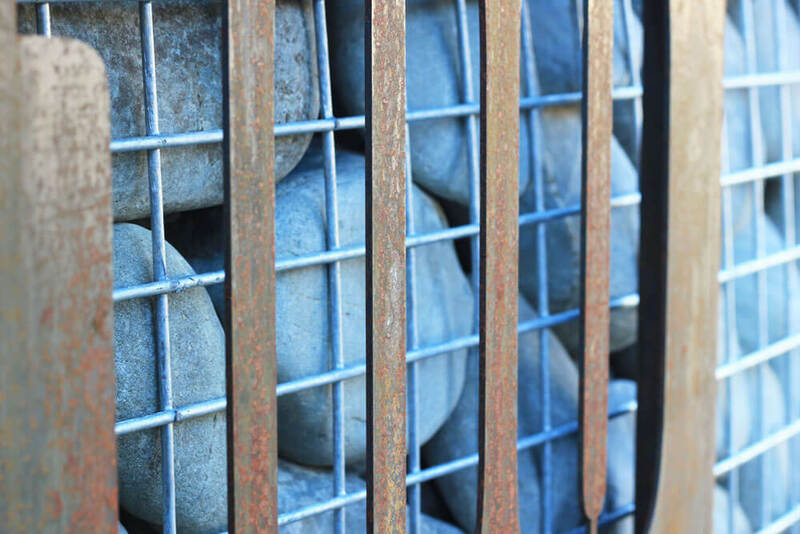 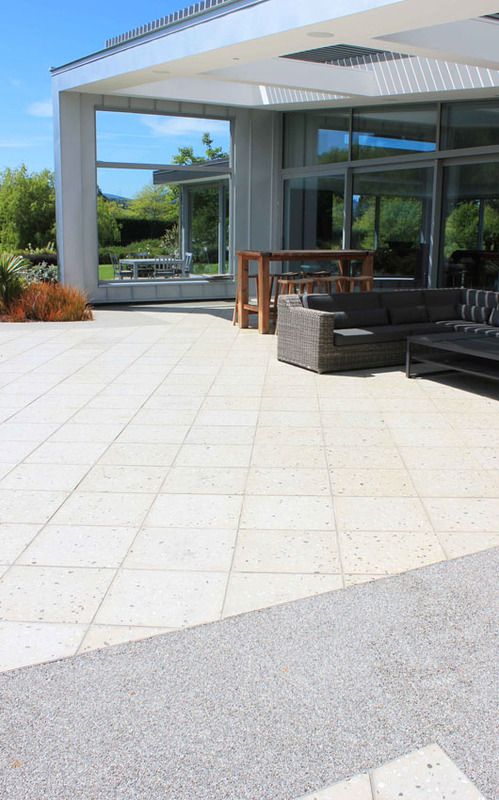 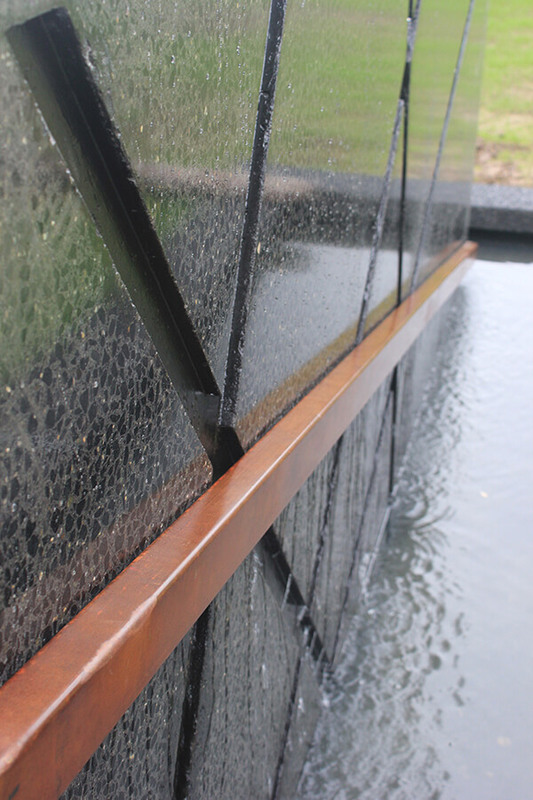 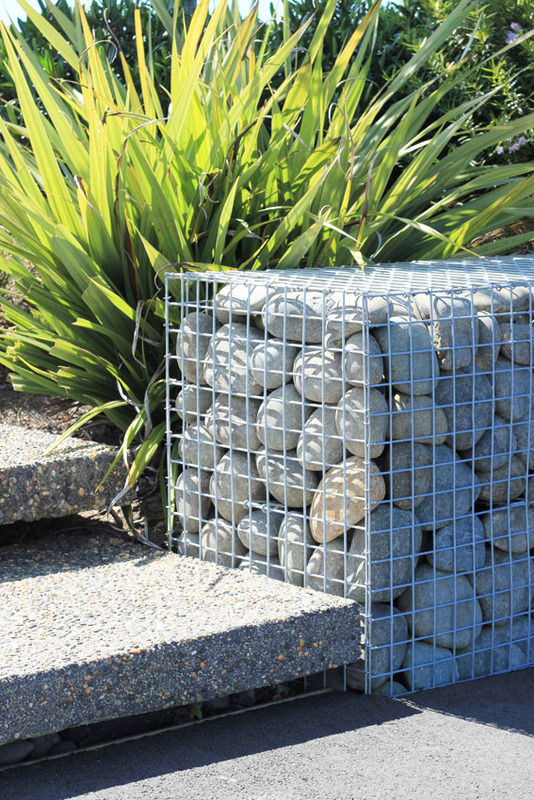 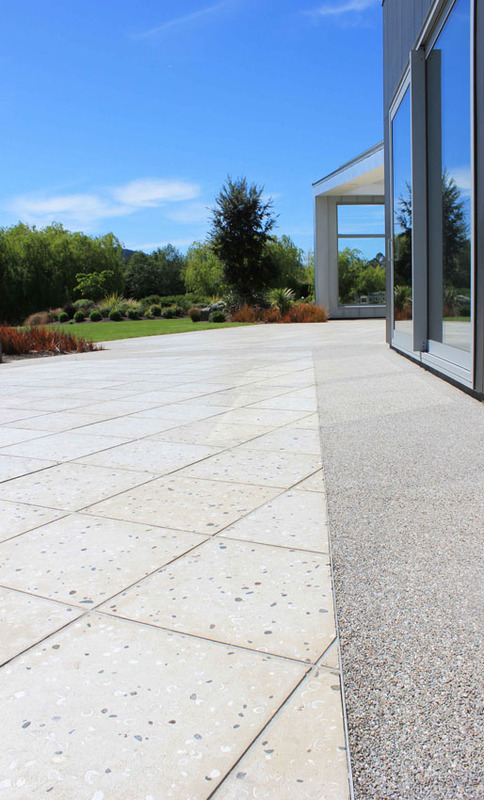 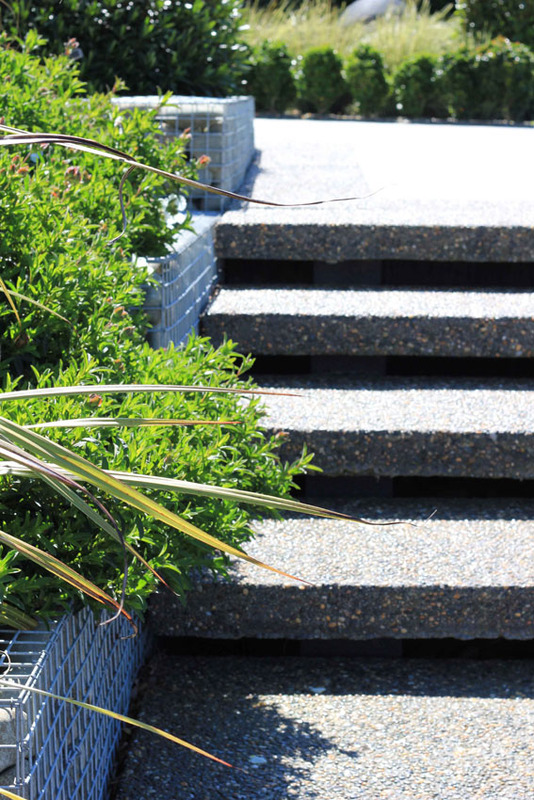 The main materials are naturalistic, using round river stone in gabion baskets, and dark exposed aggregate and STONESET permeable paving. 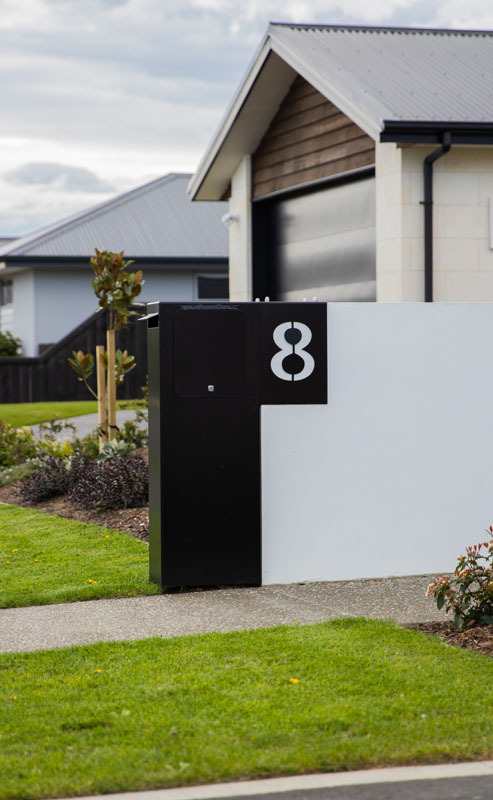 A feature design element was to direct visitors to the main door, which is elevated and at the east side of the house, so we had to create a dedicated parking space and a new set of access steps to direct vehicles away from carrying on up the drive to the utility shed. 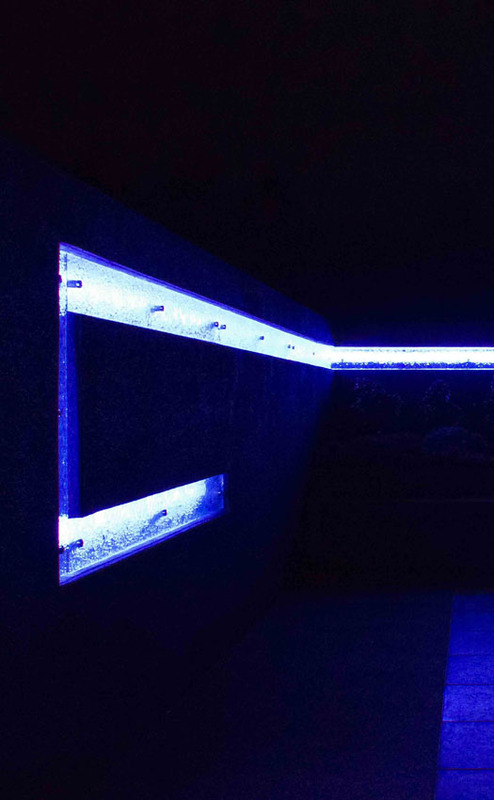 This was also highlighted at night with lighting. 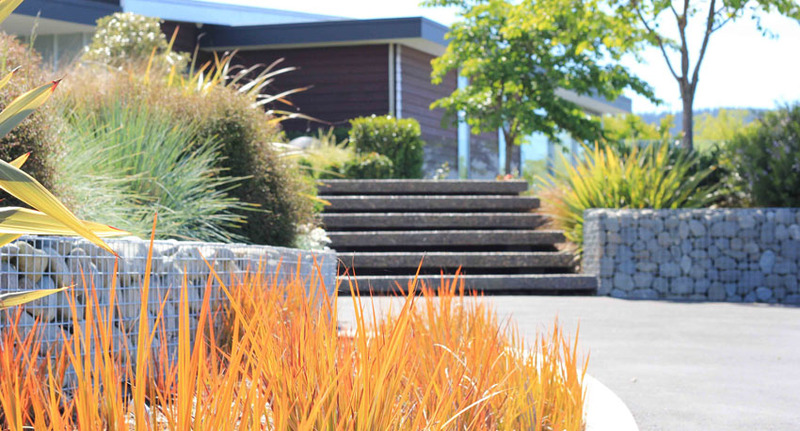 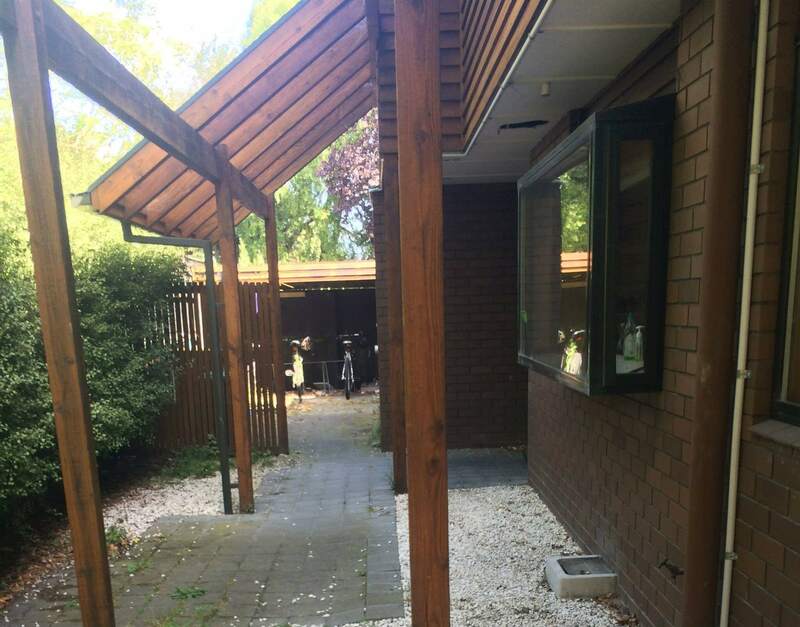 The drive itself was designed to curve in and around to both garage access and also main parking spaces, and the brief was to form an avenue effect using specimen trees in the lawn space so an almost park like feel was achieved with the use of natural grassed bunds to allow for some heights to be formed rather than just flat lawn. 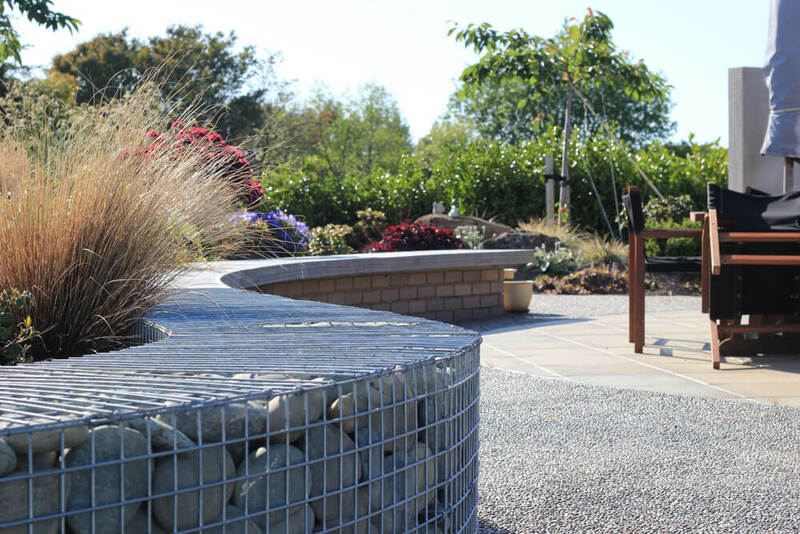 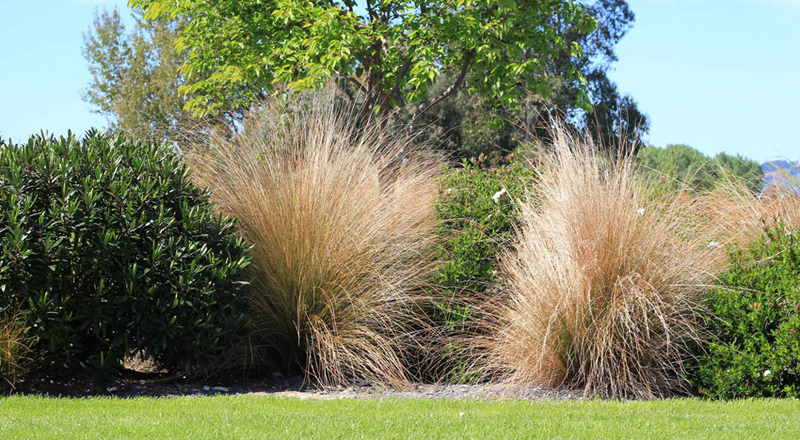 The planting follows a more natural curved garden theme using a lot of textural natives mixed with exotics and perennials so that the combinations of plant material will give all year-round interest. 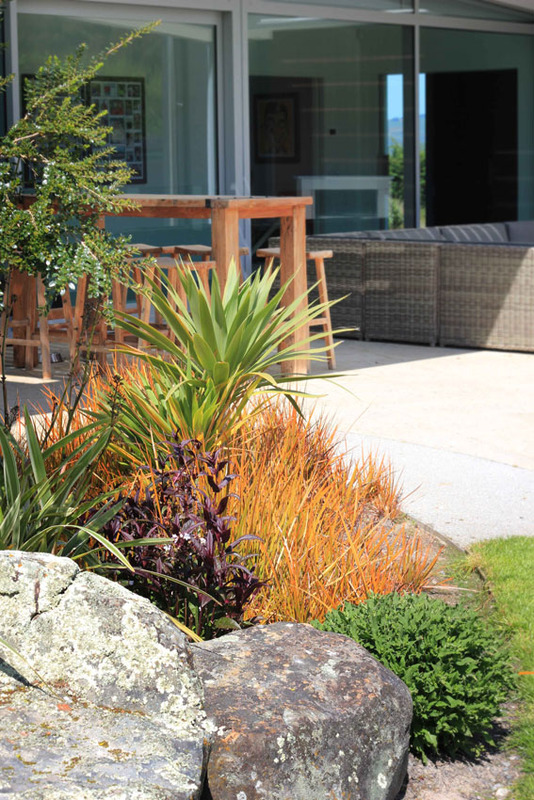 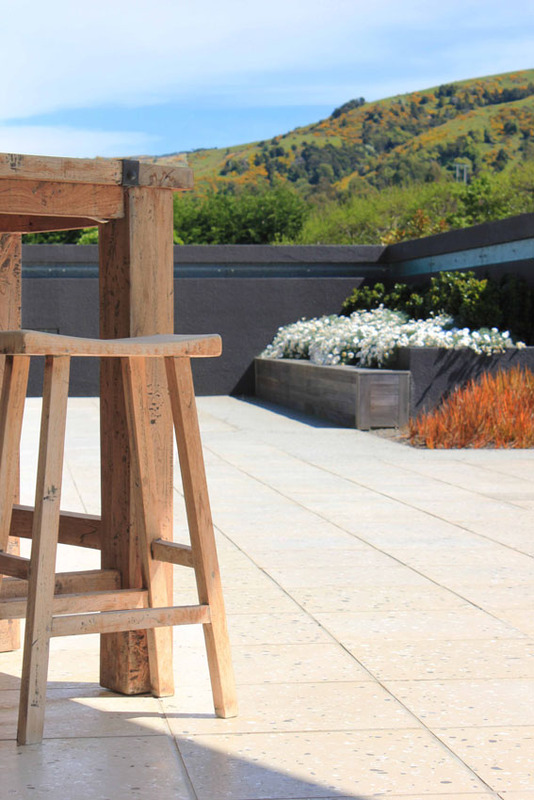 We also combined the planting with large rocks carefully placed in gardens to form some informal retaining, but to also form some areas that allow for height, with one rock in particular placed as a seat. 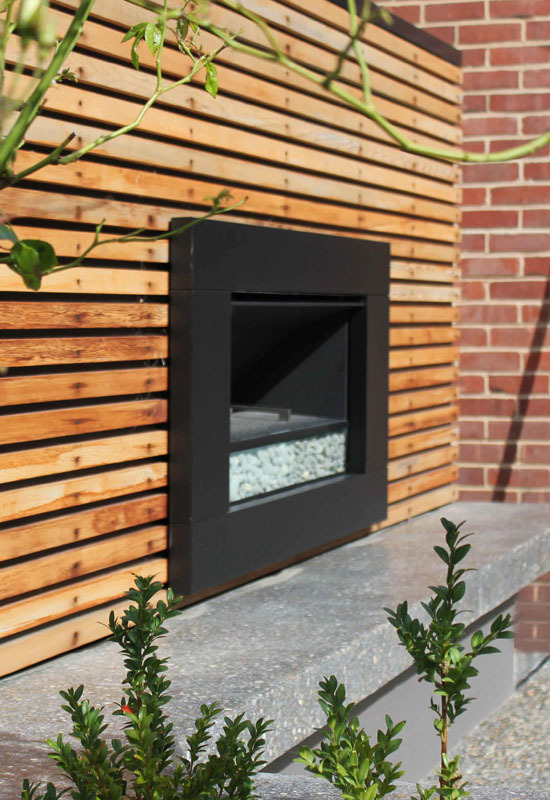 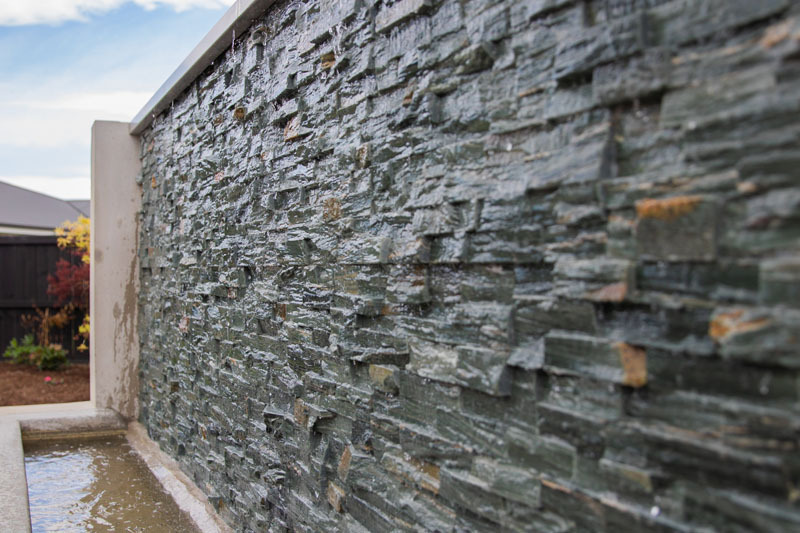 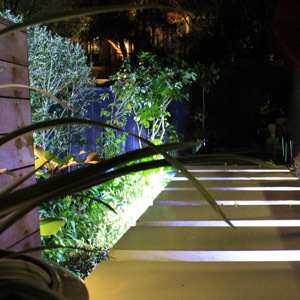 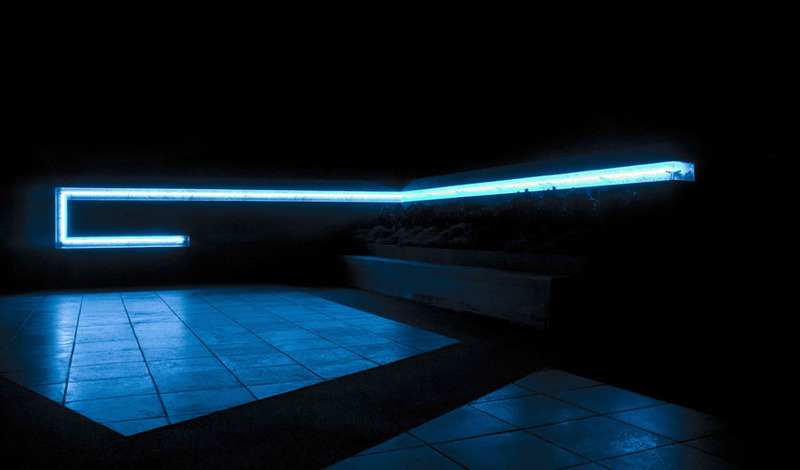 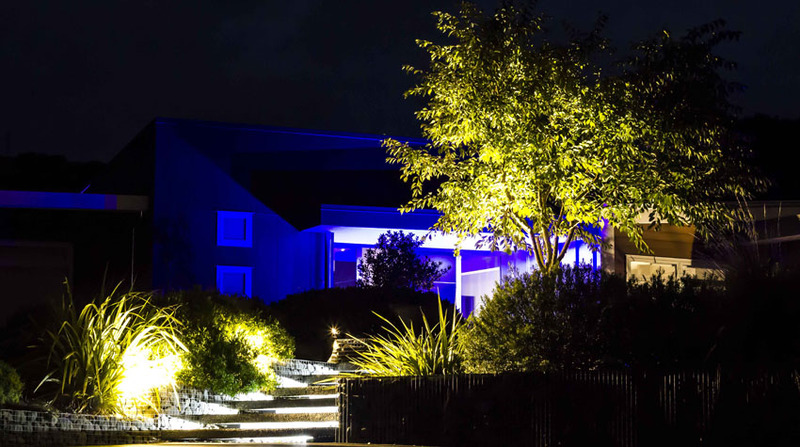 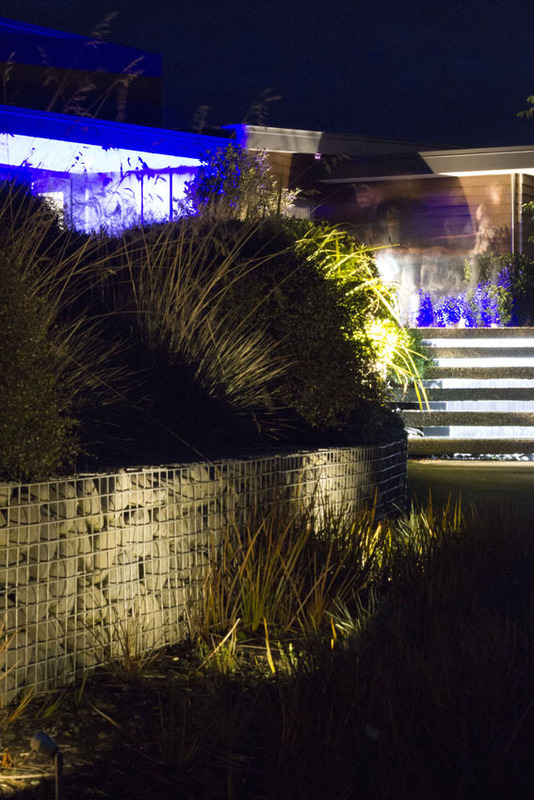 A main outdoor patio feature is a lighting sculpture placed with colour changing led strip lighting and escape textured glass cut into the main screening block walling. 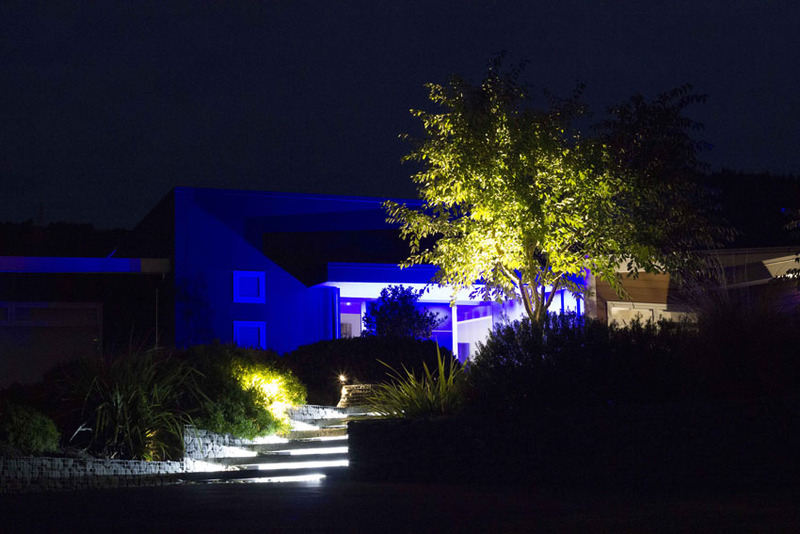 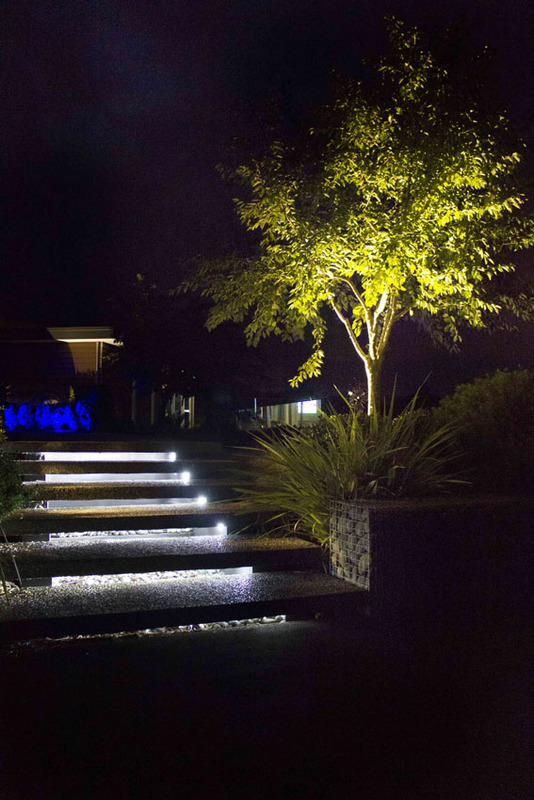 More lighting is used to highlight steps and planting and also the main entrance door sculpture pot.